Trevor Baylis invented “Clockwork radio”. Trevor Baylis is a British inventor best known for inventing the wind up radio more than 20 years ago. He was born in London in 1937 and received his education at North Primary School in Middlesex. He also studied engineering at a local technical college in Southall, Middlesex during the day and worked at a Soil Mechanics Laboratory at night. He held a series of jobs and had varied interests. He was an avid swimmer and used to swim for the Great Britain team. Unfortunately, he failed to qualify for the 1956 Summer Olympics by a small margin. He swam for the army as well as the Imperial Services and also became a physical training instructor. After leaving the army, he took up a job with a company called “Purley Pools” which manufactured swimming pools, working in both sales as well as research. He would often demonstrate the product by swimming in the pool himself, which attracted a large crowd. This led him to later form his own aquatics display company, where he worked as a swimmer, stuntman and entertainer. He also worked as an underwater escape artist for the Berlin Circus and with the money he earned, he set up his own company called “Shotline Steel Swimming Pools” which supplied swimming pools to British schools. Trevor felt a connection with disabled people, stemming from a feeling of camaraderie with stuntmen who were injured and could no longer perform. For them he developed a number of products known as “Orange Aids” which were designed to help people with limited mobility perform routine everyday functions with more ease. However, his most famous invention was a wind up clockwork radio invented in 1991. He was inspired to do this after watching a documentary about the spread of AIDS in Africa. The documentary highlighted that the only means of mass communication in Africa was via radio. However, the limited supply of electricity and batteries meant that people did not have easy access to radio, and therefore could not receive the required information which could potentially curb the spread of AIDS. Trevor used an old transistor radio and a toy car motor, to which he added a clockwork mechanism. Basically, he invented a radio that did not need batteries or electricity to run, it could be wound up like a clock and would run like a regular radio. His first working model would play for 14 minutes with a two minute wind. He patented this idea and tried to get manufacturers to back him up but no one showed much interest. In 1994 his product was featured on the BBC program “Tomorrow’s World” which generated interest from investors. Using this money, he founded a company Freeplay Energy and his radio came to be known as the “Freeplay Radio” which won the BBC Design Award for “Best Design” and “Best Product” in 1996. Trevor set up the Trevor Baylis Foundation and Trevor Baylis Brands PLC to promote and encourage young inventors as he feels that inventors like himself struggle with the bureaucracy when trying to get their products to the market. 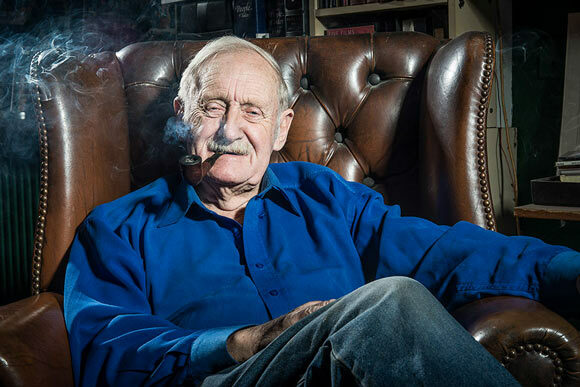 Now in his late 70’s, Trevor Baylis is unmarried and lives on Eel Pie Island in the home he built for himself 40 years ago. On the walls of his home, he has hung pictures of himself with Queen Elizabeth, Nelson Mandela and various honorary degrees he has received from universities all over the world. He was awarded an Order of the British Empire in 1997 by the Anne, Princess Royal at the Buckingham Palace.